Home » Mobile Games » Heads Up! Do you think it's funny to watch Miss DeGeneres make fools of her guests on her show? Now it's your turn to do the same to your friends! 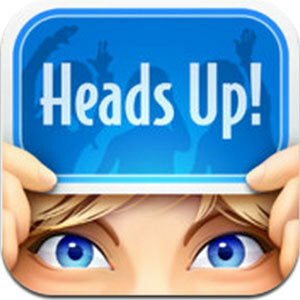 Show them all who's got the biggest brain around with the Heads Up app. See if you can describe the on-screen word without actually saying it. Do whatever it takes; impersonate, act it out and imply as specifically as you possibly can until they finally get the message. Cover a diverse set of topics, save your funniest results for posterity, and share them with the world. It's laugh-out-loud pocket-sized fun for the whole family, and it's completely free! Playing Heads Up is easy. All you need to do is pick a topic, hold your mobile device of choice up over your head so you can't see what's on the screen, and let your friends do the rest. Listen to what the have to say, pay attention to what they do, and take a guess. • Play with as many people as you like all at once. 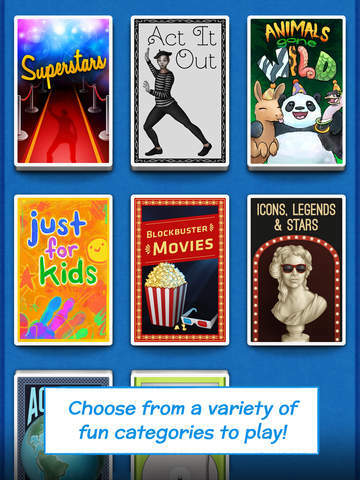 • Choose from dozens of topics, including animals, celebrities, movies, accents and more! • Communicate the on-screen word, name or concept. Imitate, impersonate, pantomime, hint or do what you hope will work. Be creative! • Change questions, indicate right and wrong answers, and keep score with a few simple tilts. • Think fast! Each round lasts for only one minute. Simply playing Heads Up is only half the fun. The other half comes in what you do once you're done playing for the moment. • Record your friends' actions. Save their most hilarious moments for all time. • Post videos up onto your Facebook account. Share the laughs with your online buddies and show them what depths you and your friends are willing to sink to. • Expand your game. Acquire more decks of questions to increase the possibilities and the ensuing hilarity. Heads Up is the ultimate party game. With so many topics to be covered that can be answered in an infinite number of ways, it's just the gift that keeps on giving. Better yet, its portable nature means that you can play it with your friends everywhere. Play it at a party, play it while you're traveling, or play it while you're waiting for something to happen. Whatever the case may be, just play Heads Up! If you've ever watched an episode of The Ellen DeGeneres Show, then chances are you've seen her subject her guests to a round of the Heads Up game. The results are always the same; both Ellen and her victim promptly spend the next couple of minutes making total fools of themselves, and the audience has a hoot. The game is real, it's available to the public, and it works just as it's presented. The only question remaining would be: is it fun? That's in large part going to depend on who you play it with, but as a free app that can be played with most any mobile device, you could do a whole lot worse. The quickest way to describe Heads Up is that it's kind of like Charades. At heart, it's a word-guessing game that requires you to convey a given word, name or theme without actually saying it outright. However, it differs from Charades in a couple of ways. For one thing, while Charades allows for multiple players to guess what one person is trying to say, Heads Up does the reverse and requires one person to guess what potentially multiple people try to tell them. The other and far more notable difference is that this game is a bit more flexible in how it plays out. You can often play Heads Up like Charades, where you can try to act out the word via body language and pantomime, but it's also perfectly valid to describe the term verbally, act out an impersonation, or just play word games with your opponent. For instance, when you need to describe an actor, you can try mentioning what movies he or she has starred in, do an imitation of their voice and mannerisms, or try to walk the player through the phonetic sound for each syllable in the actor's name. Meanwhile, a word pulled from the Accent category will often require someone to imitate the accent in question. 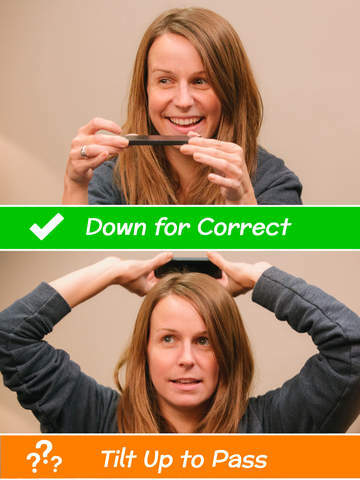 Overall, Heads Up is very easy to grasp, and if you're not afraid to indulge in a bit of grade-A silliness, it can be great fun to either act out a term or attempt to guess what your friends are trying to say. The fact that the app is free to download and can be played from a portable device makes it especially convenient. There's no need to plan anything out or carry a stack of cards with you; as long as you've got your phone, you can just start playing on the spot. However, if you can't find anyone who's not a stick in the mud, then your enjoyment of Heads Up will likely be curbed. Since the mechanics of the game depend wholly on the people you play it with, there's not really a whole lot to say about their quality. However, there are still a few details about the actual app and how it's coded that still deserve examination. The controls and interface are nothing stellar, but they get the job done. Subject categories are depicted as a deck of cards that you can select with a simple tap of your finger, and moving from question to question is a process of simply tilting your device. If the word has been guessed correctly, then you tilt it forward. If you or your partner wishes to pass, then you tilt it backwards. It's simple and it works remarkably well at moving the game along, especially since it doesn't require you to look at the screen. One of the app's cooler features is that it can record the proceedings of the game in progress. Since Heads Up can and ideally should get really crazy, this is great. There's nothing quite like saving, storing and re-watching some of your friends' funniest and most embarrassing moments. Better yet, you can post the results on Facebook to ensure maximum humiliation for what will likely be your soon-to-be former friends. Sadly, not all is well. While Heads Up is pretty good about letting the players regulate the game themselves, it's strangely restrictive on a number of fronts. For instance, a single round lasts for 60 seconds, no more and no less. All things considered, this is a pretty good amount of time to play, since it keeps things quick and frantic, but it wouldn't have hurt to give players more options. A more serious issue would be the oddly small number of categories and words the app comes with at the start. There certainly seem to be plenty at first blush, but play it enough and you'll likely see a few repetitions after a while. One way to address this issue would have been to allow players to input their own names and categories, but this just isn't the case with the free package. Instead, Heads Up allows players to expand their game by purchasing additional decks of cards with new terms and categories, one of which gives you the opportunity to make your own custom deck. This sounds like a perfectly reasonable compromise, but keep in mind that this game could end up a little pricier than you anticipated. Despite the limitations the app imposes on you, the Ellen DeGeneres Heads Up game doesn't have a whole lot to complain about. The initial package is free and since all you need to play it is a phone, it's a great way to entertain a whole group of people anywhere on short notice. If you have a good circle of friends you regularly get together with, give Heads Up a whirl. If you like it, then feel free to make it better by buying a few extra decks.